It's another Saturday! Lately, I found myself to be quite lethagic, or is it lazy? I woke up on a Saturday, not knowing what to bake. Reason being, my youngest sister is not in town, though my parents have returned from their trip. My third sister won't be going to my parent's house for dinner. Maybe that was the reason for me not motivated to bake. Usually, I like to bake a quite a number of stuff on Saturday for my sisters and parents. However, not today. Quite unlike me though. Today, I had planned to make pancakes for breakfast, so I had to make it since there wasn't much food in the house. Here are the bakes I did today. 1. 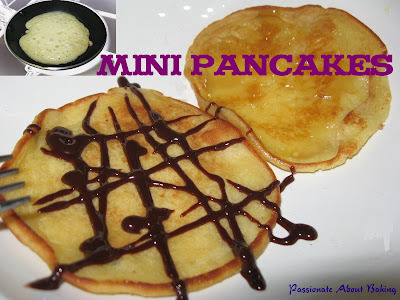 Mini Pancakes for breakfast. My children love the pancakes. Not enough batter to go around, so the adults didn't get to eat (except me). For toppings, I had the chocolate syrup and the maple syrup with butter respectively on my pancakes. 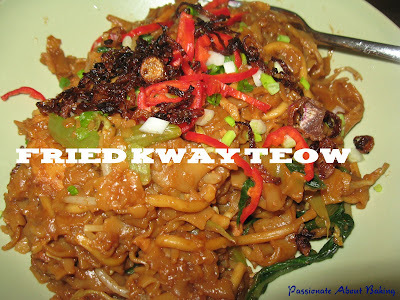 Recipe will be given below. 3. 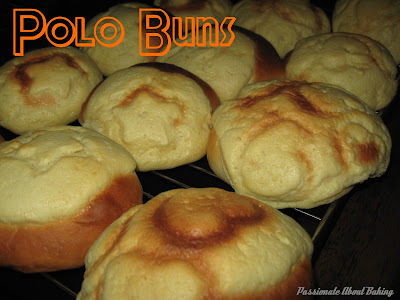 Polo Buns. I can't decide what buns to make. 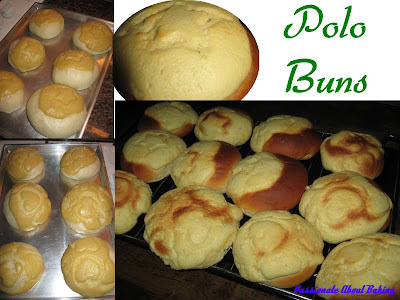 While the dough was kneading in the mixer, I decided to browse through a couple of recipe on Polo Buns. I was looking for Grace's recipe, but apparently, I had misplaced it. Happy Home Baking also has a recipe on this. And lately, I saw a modified version of Grace's on Honey Bee Sweets which looks good too! On Alex Goh's World of Bread, it also a recipe on this. Urh... So many good recipes, but don't know which one to use. Finally, I settled on the pastry from this Japanese site. I used HHB's method on using a cutter to "shape" the pastry. I was pretty happy with the end results of the bake, though I've not tried the buns as at now. 4. 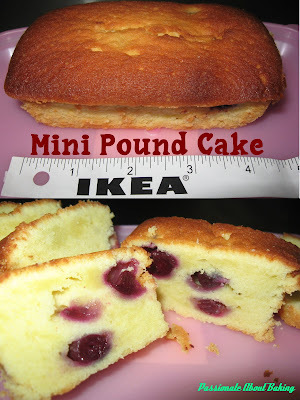 Blueberry Cream Cheese Pound Cake. Since my people has good reviews about this cake, I thought I'd give it a second attempt to bake for my family too. Same as the previous bake, I put them into smaller pans so that I don't have to cut them and give them away. The results is satisfying too! 2. Separately mix the wet ingredients together. 4. Mix until lumpy but thorough. 5. Heat a non-stick pan with oil or butter, then cook till still brown. 6. Serve with chocolate syrup, maple syrup with butter, or whipping cream or fruits. 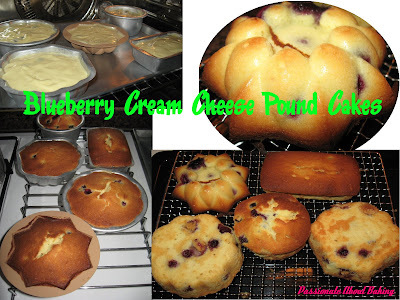 Everything looks delicious, but man, that blueberry cream cheese poundcake is calling to me! It looks so scrumptious. I just may have to head into the kitchen to make myself one! Looks like you are "hooked" onto the Cream cheese pound cake too Jane, heehee.